That had to be it, right? Last night’s insane comeback by the Cleveland Indians had to be the moment we’ve been waiting for, the one which finally pushed this team out of its season-long funk. Surely the rally pulled off by the players made them realize they can’t just sleepwalk all the way to the postseason. Actually, let’s backtrack for a quick second. For the better part of the 2017 season, the Indians have been stuck in neutral. When it seems as though they’re about to start living up to their potential, they fall back into the mud. Sweep the Texas Rangers in powerful fashion to open the year? Win two of the next nine games. Sweep the MLB-best Houston Astros? Lose six of the next seven series. Such is life for the Indians midway through a season of high expectations. However, it certainly seemed as though they had figured it out last week, winning seven of eight in convincing fashion. Surely a set of games during which Cleveland scored a total of 68 runs and reclaimed first place in the AL Central was the turning point we were waiting for, right? Wrong. A dismal weekend sweep at the hands of the Minnesota Twins – in which the Tribe scored two runs and stranded 30 runners – resulted in the return of this team’s trademark inconsistency. After a series like this, many began wondering if Cleveland would ever start playing like the defending AL champions. Said thoughts were hammered home early in last night’s bout against the Rangers. Fans hoping a new opponent would fix the Tribe’s woes were greeted with a 7-1 deficit just an inning and a half into the game. By now you know what went down. The Indians headed into the bottom of the fourth in a 9-2 hole. They won by a final score of 15-9. It’s how this game was played which makes you hope (pray, really) it’s the kick-start the Tribe has needed all season long. There are few reasons which certainly lend credence to the idea last night’s rally was the moment it all clicked for Cleveland. The most obvious being the size of the hole the team dug out of. Over the weekend, the Indians somehow made 4-0 deficits seem like 100-0. After littering the 2016 season with memorable comebacks, they haven’t really mustered any to speak of this year. Despite this, Cleveland stunned everyone Monday, scoring 13 unanswered runs to, as TV commentator Rick Manning noted, turn a rout into a rout. Also noteworthy is how the Tribe assembled its rally. The Indians scored 15 runs, yet not one was generated on a ball that left the stadium. Instead of cashing in on clutch home runs, they eked out RBI after RBI on timely hits or running out infield singles. It was a team-wide display of effort and hustle we frankly haven’t seen a lot this year. Finally, the way the Indians carried themselves throughout the comeback indicated they may have finally got their act together. This team has spent the majority of the season playing as though it just expected to win by showing up. Manager Terry Francona called his players out for such an offense, and has been hammering home the idea they can’t just assume another World Series appearance is on the horizon. 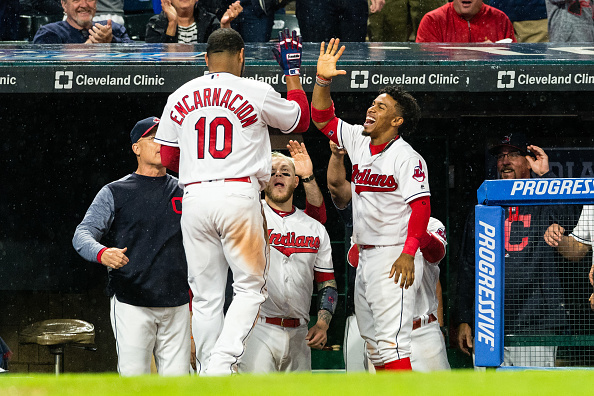 On a night when they were served up a seven-run deficit and watched as Francona left the game with an illness, it certainly seemed like an opportunity to just roll over, sustain some energy and live to play another day. Instead, the Indians displayed an outright refusal to quit. They kept fighting, scratching off runs in any way possible to eventually turn a seven-run hole into a six-run lead. Now, as fun as last night was, it’ll be nothing but a footnote if the team once again follows up a great game with a dud. In fact, watching Cleveland all season long, such a scenario actually feels more likely than not. However, the aforementioned reasons certainly make this win feel a little different for the Indians. Here’s hoping this is proven right.